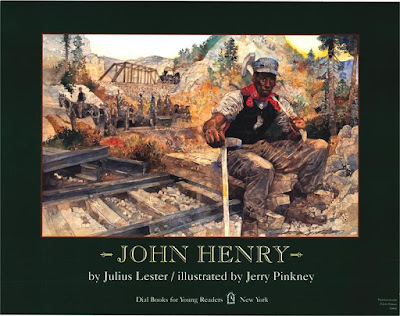 Gonna whop that steel on down"
I'll die with a hammer in my hand""
John Henry" is a folk-blues song that is more closely associated with the Appalachian-Piedmont blues tradition than the Mississippi one. 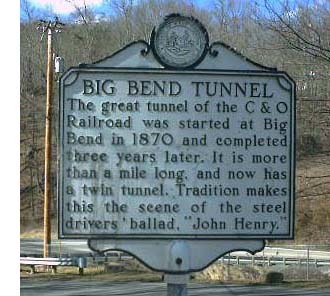 Like many of the best folk songs, it may have been based on real life events. It was certainly used as a rallying song during the civil rights movement of the fifties and sixties. It has foreboding, superhuman heroic acts, and of course, death. In the very first stanza of the song the hero, then just a child, knows that he's not long for this life and will die in a heroic sacrifice. Of course, the nature of the sacrifice is debatable, especially in today's post-industrial world where physical labor often is considered suitable only for people not smart enough to do anything else. There are many different interpretations of this song. As with most blues songs there are several different lyrical variations. But every version hits the key points. 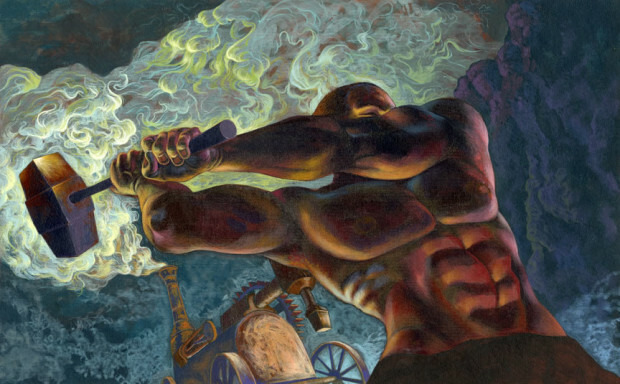 John Henry was a steel driving man who, when threatened with loss of his livelihood via automation, takes up the challenge and beats the machine, but only at the cost of his life. The song's most obvious theme, and likely why it was used in the civil rights movement, is one of resistance. John Henry defends his pride, his livelihood, his masculinity, and his humanity against the steam drill, even though he knows he's going to die. Once the fear of death is removed from the equation a man can't be cowed or beaten. Anyone should be able to see why that interpretation would have been comforting to black people confronting vicious dogs, two-legged and four-legged, and fire hoses in the fifties and sixties. Now you can certainly say that in John Henry's specific situation he would have been better off looking for a different battle to fight, but that's never the point of stories like these. Secondarily the song references boasts of virility. Back in the day a steel driving man wasn't just a man who could hammer the steel bits for hours. He was also a man who could hammer something else for hours. And in many cultures the hammer is associated with masculinity. There are other old blues songs in which men boast about the hammer they swing or women joke about how (hopefully temporarily) her trusty steel driving man has run out of steam. The song also expresses the pride of the working class man battling the capitalist whose interest is by definition always in replacing as many workers as possible. The song's invocation of steadfastness and superhuman strength in the face of adversity is something that fits in perfectly with the historical experiences of Black Americans. It may have a more dangerous downside though. Much like the tragic Boxer in Animal Farm, the experiences of Black Americans may have predisposed them to be unwilling to ever admit need, weakness or vulnerability while believing that all problems can ultimately be overcome by confrontation and hard work. So under this world view if you haven't been successful it's because you aren't trying hard enough. And it's better to grit your teeth and get through whatever is afflicting you than to ask for help or worse yet, mercy. Because chances are quite good that no one is looking to help you while your enemies won't have mercy. This framework can be very protective to those struggling to protect their egos, bodies and souls against vicious racism. It can also destroy men by causing them to discount their own health and much like their mythic forebear, die early from hearts that simply can't take the stress. There have been some studies on this, but more work remains to be done. The John Henryism hypothesis assumes that lower socioeconomic status individuals in general, and African-Americans in particular, are routinely exposed to psychosocial stressors (e.g., chronic financial strain, job insecurity, and subtle or perhaps not so subtle social insults linked to race or social class) that require them to use considerable energy each day to manage the psychological stress generated by these conditions. However, the hypothesis also assumes that not all individuals so exposed will respond to these noxious conditions with high-effort coping.